The Easter Parade and Easter Bonnet Festival is not exactly an organized event. 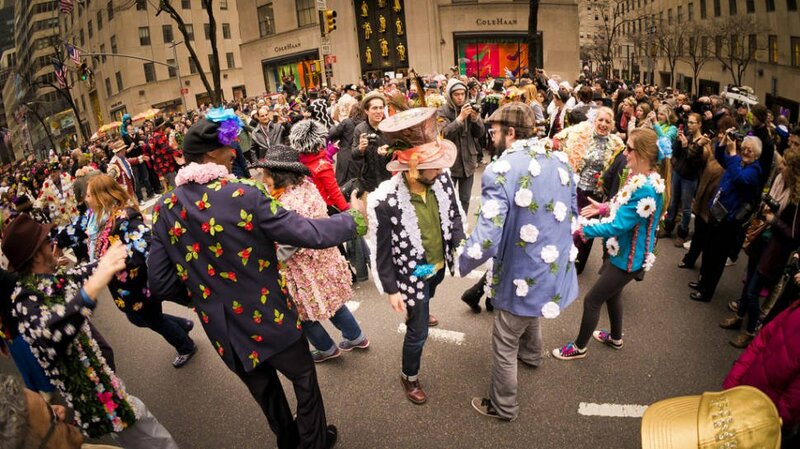 On Easter Sunday, Fifth Avenue (from 49th St to 57th St) closes for transport, and the fun begins. The participants wear weird, funny, inventive costumes and wander around the street. Sometimes they include lots of flowers or even live animals like rabbits or pet snakes. The bonnets, of course, are essential. You'll be surprised how odd, creative, or absurd they can be: made out of frames, carrots, flower pots, or bird cages. Some of them are normal hats decorated with tons of flowers, eggs, plastic birds, feathers, or even bubble gum. Some are tiny, and some are huge, ​but a​bsolutely all of them are worth seeing. Because imagination has no limits.